The TUNEL technique is used to detect dying cells with fragmented DNA (Fig. 1). For TUNEL staining, ovaries or embryos are treated as for in situ hybridization and antibody staining. The following protocol was derived from the description of ovarian tissue preparation by Verheyen and Cooley (40), from descriptions of embryo staining in protocols 54 and 95 in ref. 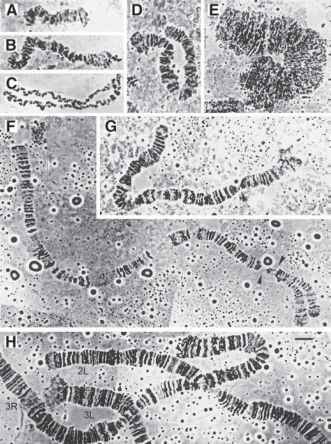 41 and from the description of TUNEL staining by White et al. (11,42). 1. Remove DR from ovaries (see Note 5), add 100 |L fix and 500 |L heptane, and rotate gently for 30 min at room temperature (RT). 2. Remove heptane/fix and wash twice with excess PBT, taking care to remove all heptane droplets. Proceed to Subheading 3.2.4. 2. Transfer the embryos to the fixing solution (see Note 6), shake well, and rotate for 20 min at RT. 3. Remove the fix (bottom layer) first and then remove the heptane. Add fresh heptane and shake. 4. Add a double quantity of methanol and shake hard (vortex) for 2 min to remove the vitelline membrane. 5. Discard embryos at the interface, remove the heptane and then the methanol, and wash twice with methanol. 6. Rehydrate through a series of 75%, 50%, and 25% methanol in PBT. Proceed to Subheading 3.2.4. 1. Remove DR, replace with 500 |L fix/500 |L heptane, and rotate for 30 min. 2. Remove the fix and rinse twice with PBT for 5 min while rotating. 3. Remove the PBT and rinse with methanol. Wash again with methanol for 30 min while rotating. Tissue may be stored indefinitely in methanol at -20°C following the first methanol wash.
4. Rehydrate through a series of 75%, 50%, and 25% methanol in PBT. Proceed to Subheading 3.2.4. 1. Treat fixed tissue with Proteinase K, 10 |g/mL in PBT (50-250 |L, 5 min for ovaries and imaginal discs, 3 min for embryos), and wash twice with PBT. 2. Postfix for 20 min in a solution of 4% paraformaldehyde in PBS, then wash five times, 5 min each, in PBT. 3. Equilibrate for 1 h at RT in EB. 4. Incubate overnight at 37°C in a reaction mix consisting of RXB and TdT in a 2 : 1 ratio, with 0.3% Triton X-100 (total volume 50-100 |L). 5. Preabsorb anti-DIG-AP, diluted 1 : 2000 in PBT, with fixed tissue at RT for 2 h or at 4°C overnight. 6. Remove the RXB and TdT from tissue and incubate in SWB diluted to 1 : 34 in water at 37°C for 3-4 h, first with three quick washes and then once every 30 min. Remove SWB and wash three times, 5 min each, in PBT. 7. Block in a solution of 2 mg/mL BSA and 5% normal goat serum in PBT for 1 h at RT. 8. Incubate tissue in preabsorbed antibody for 2 h at RT or overnight at 4°C. 9. Wash four times for 20 min each in PBT and wash twice, 20 min each, in pH 9.0 buffer. 10. Add 3.5 |L of NBT and 4.5 |L of X-Phos to 1 mL of pH 9.0 buffer and incubate tissues, watching carefully for the color reaction. 11. Stop the reaction with two PBT washes and mount in 70% glycerol. Fig. 2. A 10-h embryo stained with acridine orange. Most of the staining is in the head and central nervous system. The dorsal staining is due to autofluorescence of the yolk.